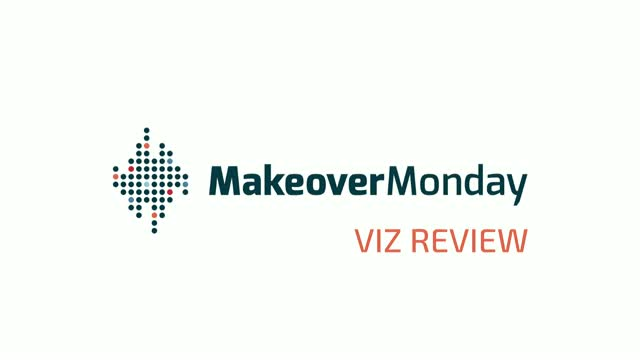 Join the Makeover Monday community for a live webinar to discuss selected data visualizations from this week's submissions. You can participate in the webinar, ask questions but also submit a viz ahead of time for review (do this on https://data.world/makeovermonday by submitting your visualization in the Viz Review discussion for this week's dataset). VIZ REVIEW is our way to provide much more comprehensive feedback for everyone, which is always difficult within the limitations of Twitter and short-form comments in general. Find out more about Makeover Monday on www.makeovermonday.co.uk (http://www.makeovermonday.co.uk/) and join the conversation on Twitter by following Andy (@VizWizBI) and Eva (@TriMyData) as well as the #MakeoverMonday community.